THE SKINNY: I love trying new products before they are available. 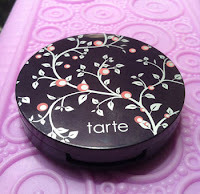 Tarte's new Achiote Cheek Tint came in a recent Glossybox. It will be available this month and can already be purchased as part of a kit from QVC. What is great about this product is that it is an-almost blush for non-blush wearers. The universally flattering peach color looks great without going on too strong. It works for a variety of skin tones and can be layered to create a subtle or dramatic look. I also really liked the super-creamy formula. Just a dab was perfect to add a hint of color to my drab winter skin. (It almost looks like a kiss of sunshine.) The blendable color lasts for hours. I also loved the cute little compact. 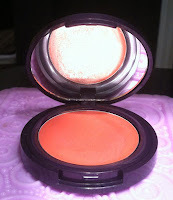 Seriously, since getting this product, I have actually been wearing color on my cheeks -- something I just don't do. CHECK IT OUT: This product will be out later this month from Tarte.